Hoping to bring home that big buck this deer season? 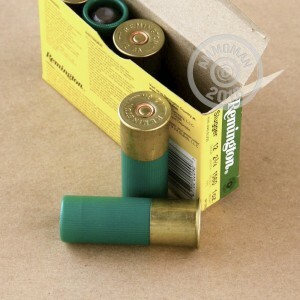 Be ready with this 12 gauge Remington Slugger ammo! 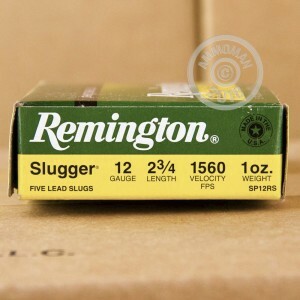 This lead rifled slug is an excellent choice for big game hunting, or to have around for home defense. Nothing is getting away that has been hit in the right spot with this powerful ammunition. The 2 3/4" 1 oz. slug will arrive at your door in new and excellent condition. You will notice consistent shot-to-shot velocities of 1,560 feet per second. The product is designed specifically for smooth bore barrels, but can also be used in rifled choke tube barrels or fully rifled barrels. Remington products were founded in 1816 when Eliphalet Remington II believed he could build his own gun better than what he could buy. He did so with great success. Cartridges were added to the mix in 1867. 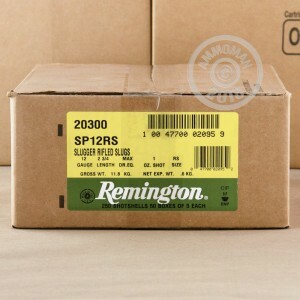 Today, Remington is still going strong and continues to be an outstanding leader in the ammunition industry.